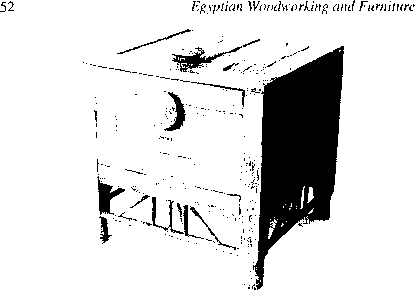 In 1925 George Reisner, an American Egyptologist, discovered the furniture of Queen Hetepheres at the bottom of a deep shaft close to her son Khufu's pyramid at Giza. 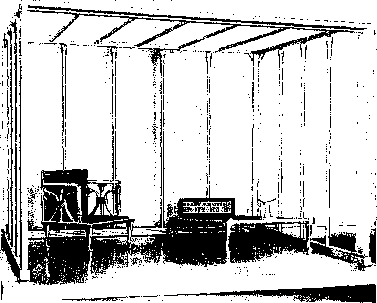 Her body was not found in this small chamber, leading Reisner to believe that the tomb where she had originally lain had been robbed and her body stolen shortly after her death. The contents of that tomb were moved to this second chamber, which would have been under tighter security, being within the Great Pyramid complex. both in the Egyptian Antiquities Museum in Cairo and the Museum of Fine Arts in Boston. The queen's furniture would have been placed within a canopy made from wooden jambs, battens and poles that were finely gilded (figure 37). The entrance jambs have inscriptions raised in relief which give the name and titles of her husband, Sneferu. The back pillars, which are carved with a matted pattern, are held together with copper staples. The floor and top rails are fixed to the vertical corner posts with a number of complex joints, and poles are spaced around the walls of the frame. Roof poles have also been dovetail-jointed into the top rails of this canopy. To prevent wear at the joints, each has been carefully encased with copper plates that have been folded to shape and tacked through the gold sheet to the wooden core below. This suggests that the canopy was portable. Around the walls and across the roof were hung, on copper hooks, netting and curtains which provided the queen with privacy and protection from insects and comfort from the chilling night air. Two armchairs had been placed in the tomb, but unfortunately only one could be reconstructed. Each had legs of lion form and stood on copper drums and shoes. The back support of the reconstructed armchair shows that it was made from a mitred frame that was covered in gold and enclosed a plain, solid-wood panel. The chair's arms were semi circular in section and the vertical front posts were raised with a matted pattern. The spaces below the arms were filled with a spray of three tied papyrus flowers, carved in the round and covered with gold sheet. A cushion may have been placed on the wooden seat, which was made from another solid panel. Also discovered was the queen's bed, which again was covered in gold sheet and stood on lion legs. The general shape is similar to those beds discovered in the Early Dynastic Period but it slopes, like the Hesire illustrations, downwards towards the bed's foot. Boards have been rebated into the side poles of the bed, on which the queen would have slept. For the first time a footboard has been attached to the bed. It was inlaid with many pieces of coloured faience in a feathered pattern, which is also repeated on a long box which held the curtains that hung around the canopy. Two smaller boxes were also found that contained the queen's bracelets and a headrest. headrest at the top of the bed. Also discovered in the tomb of Queen Hetepheres was a carrying chair, a similar one to which is shown in relief in the tomb of Queen Meresankh III (figure 39). These carrying chairs are of frame and panel construction and are attached to a pair of long poles which have handles of papyrus-flower shape. What motifs were found on the royal furniture associated with Queen Hetepheres and King Tutankhamun?